Learn how to use the conditional tense in English. 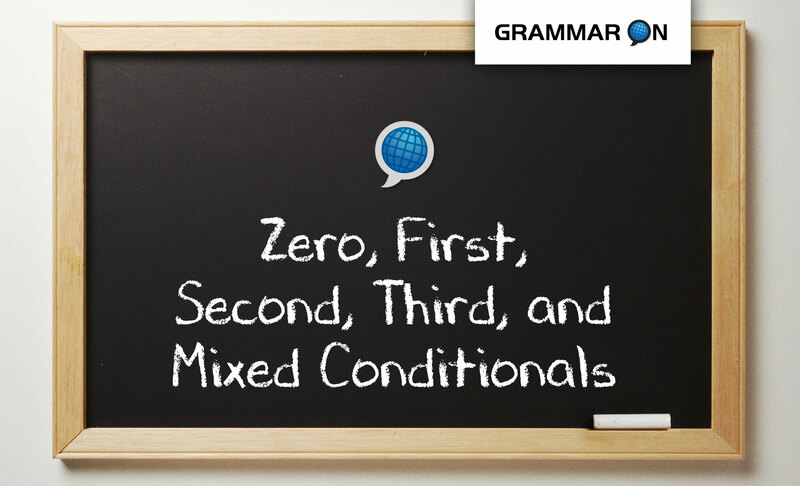 Study the zero, first, second, third and mixed conditional in English. In today’s free English grammar lesson I will teach you how to use the conditional in English. Keep reading to download this lesson on the conditional tense in pdf format with exercises! Are you an English teacher? If so, don’t miss the teacher’s guide at the end of the lesson. Please download this lesson to use in your English class. If you have any questions, or would like to add anything else, please contact me. Let’s learn how to use the conditional tense in English! Learning how to use the conditional tense in English can seem confusing. However, by breaking up the conditional into the zero conditional, first conditional, second conditional, third conditional and finally the mixed conditionals it is easier to learn. We use the zero conditional To talk about a general “condition” or to describe something that usually happens. IF + SUBJECT + V1 / SUBJECT + V1 SUBJECT + V1 / IF + SUBJECT + V1 Zero Conditional Examples: If I go to the beach, I take a towel. I put on my headphones if I use my phone on the bus. *When it is sunny in Miami, I go to the beach. If it rains, I stay home. *When shows more frequency than if. Zero Conditional Exercises and Practice A good way to escape boredom is to find a hobby. Using the zero conditional, tell what each person does when they are bored. The first example is done for you. 1) Roscoe likes to fish. If Roscoe is bored, he fishes. 2) Morgan has a stamp collection. _________________________________. 3) Erica loves to cook. __________________________________________. 4) Michelle calls her boyfriend. ___________________________________. 5) My mother writes letters. ______________________________________. 6) Devon drives around town. ____________________________________. We use the first conditional to talk about a real possibility. IF + SUBJECT + V1 / SUBJECT + WILL + V1 SUBJECT + WILL + V1 / IF + SUBJECT + V1 (Never use IF + WILL + verb!!!) First Conditional Examples: If you visit Miami, I will take you to dinner. I will buy a red shirt if I don’t find a blue one. If I see her tonight, I will tell her about the party. *When I get home, I will look for the book. *When shows more certainty than if. First Conditional Exercises and Practice The American singer Doris Day sang a song called “Que Sera, Sera,” which is Spanish for “what will be, will be.” While we can’t know what the future will be, it’s fun to imagine. Using the first conditional, write a one-sentence response to each future prediction. The first one is done for you. 1) You will make a lot of money. _If I make a lot of money, I will move to the mountains and live in peace! 2) You will have six sons. ____________________________________________________________________. 3) You will travel to Antarctica. ____________________________________________________________________. 4) You will become famous. ____________________________________________________________________. 5) You will go to jail. ____________________________________________________________________. Practice using the imperative with the zero and first conditional: Complete the sentences with your own ideas. 1. When you arrive in Miami, _________________________________________. 2. Welcome to my house. If you get hungry,_________________________________________. 3. Don’t get upset if I _________________________________________. We can also use the imperative with zero and first conditional. Examples: If it rains tomorrow, use an umbrella. / When it rains, use an umbrella. Call your mom if you have time later. / Call your mom when you have time. We use the second conditional to talk about an unreal possibility. IF + SUBJECT + *V2 / SUBJECT + WOULD + V1 SUBJECT + WOULD + V1 / IF + SUBJECT + *V2 (Never use IF + WOULD + verb!!!) *We use the Past Tense form, but we are not speaking about the past. Second Conditional Examples: If aliens landed on earth tomorrow, I would be very surprised. (Aliens won’t land tomorrow.) I would walk your dog if I had time. (I don’t have time so I will not walk your dog.) If I **were the president, I would lower taxes. (He or she is not the president.) I would go on vacation if I had money. (He or she doesn’t have enough money.) **the verb to be: were is used with all subjects, although was is common in spoken English. Second Conditional Exercises and Practice A. Using the words in parentheses, complete the text below with the appropriate forms. 1. I am so busy this week that I can’t make it to my English class. I ______________________ (love) to come if I______________________ (to be, not) so busy. 2. Tell him I am sorry that I can’t help him. If I ______________________ (have) the money, I ______________________ (lend) it to him. 3. I live in Campodimele, Italy. If I ______________________ (live) in Miami, I ______________________ (study) English at Language On! B. Please write a five-sentence paragraph about what you would do if world peace were declared tomorrow. Use the second conditional, as this is an unreal possibility. C. Write questions for a friend beginning with a Wh (question word) + would. Discuss your answers. Zero, First, and Second Conditional Exercises and Practice Complete the sentences using the Zero, First, or Second Conditional. 1. If I have to work this Saturday,_______________________________________________________. 2. When I am bored,__________________________________________________________________. 3. If I moved to Japan tomorrow, _______________________________________________________. Third Conditional Exercises and Practice A. Using the words in parentheses, complete the text below with the appropriate forms. 1. I was so busy last week that I couldn’t make it to my English class. I ______________________ (love) to attend if I______________________ (to be, not) so busy. 2. Tell him I am sorry that I couldn’t help him. If I ______________________ (have) the money, I ______________________ (lend) it to him when he asked. 3. I grew up in Russia. If I ______________________ (grew up) in Miami, I ______________________ (learn) English as a a child. Zero, First, Second, and Third Conditional Exercises and Practice A. Complete the sentences below with the verb in the correct form and tense. 1. Tom had a car accident last week because he was driving too fast. If he ___________________________ so fast, he __________________________ an accident. 2. Tom can’t go fishing this weekend because he doesn’t have a boat. If he ____________________________ a boat, he ____________________________ fishing. 3. Tom couldn’t go to the interview because his car was being repaired. If he _________________________ a car, he __________________________ to the interview. 4. Tom is pretty sure that it will rain tomorrow, so he plans on going to the cinema. If it _____________________________ , he _____________________________ to the cinema. B. Choose another person (a friend or a famous person) and write a paragraph describing what your life would be like and would have been like if you had been born as them and now lived their life. C. Match the correct clauses to form a sentence. 3 I still wouldn’t tell you. D. Research and write an alternative history: choose an important event in history and its outcome. Prepare a presentation detailing another scenario or outcome. For example: What if Japan hadn’t attacked Pearl Harbor, dragging the USA into the war? What if the Cuban Missile Crisis hadn’t been resolved? Mixed Conditionals Exercises and Practice A. Complete the sentences below with the verbs in the correct form and tense. 1. Tom is in the hospital because he had a car accident last week. If he ___________________________ (have) a car accident last week, he __________________________ (to be, not) in the hospital now. 2. Tom can’t go fishing this weekend because his boat sunk. If his boat ____________________________ (not, sink), he ____________________________ (go) fishing this weekend. 3. Tom couldn’t find his keys because his house is always so messy. If his house _________________________ (to be, not) always so messy, he __________________________ (found) his keys. Teach the conditional tense in English! Below are some ideas to use as you teach the conditional tense in your ESL classroom. Please feel free to add more by comment below or send me an email with your comments, question, and/or concerns. Happy teaching! 1. Have students describe good decisions they have made and then follow up with “If I hadn’t decided…..” etc. You can repeat this activity with bad decisions that have been made. Make sure they focus on the 3rd Conditional. As a follow-up activity have them write a descriptive paragraph. 2. Play “If” by Pink Floyd and have the students take notes. Then have them discuss and interpret the meaning of the lyrics as well as the uses of the conditional. They should then write 2 lines of their own in the same format as the original song, throw the lines on the floor and pick them up randomly to create their own song. 3. As a class, read and discuss songs that use the 2nd conditional. (“If” by Pink Floyd, “If I had the World to Give” by the Grateful Dead….. there are many more out there!) Or, if you can find one song for each 2-3 students, have them work in pairs/small groups to discuss the song and its meaning before presenting to the class. 4. Assign random “What would you do if …?” questions and have the students discuss, first in pairs, then as a whole group. 5. Ask students to imagine how the world would be today if certain events or inventions had not happened. As a class discuss, for example, “If Steve jobs hadn’t invented the iPhone….” “If the USA hadn’t gotten involved in WWII..” This can be turned into a research and presentation topic. 6. Teach the pronunciation of the contracted forms of the conditional in speech. Teach word stress patterns associated with the conditional. Remind students of the contractions that we use for the past perfect. a. I had never eaten it before. I’d never eaten it before. b. She had read it. She’d read it. c. It had been here. It’d been here. Teach students the contractions for would, could, and should with have. Tell them that they might even here the “woulda” form in casual speech. Inform the students that there should be a little schwa sound (ə ) after the d in could, should, could before the have. This will make it sound like could‘uh’ve. Inform the students that in “usual” speech we place the stress on the noun, or the most important word in the sentence, and “glide” over the contractions very quickly. Have the students write sentences using the contracted forms. Have them underline the noun or nouns, or the most important word in the sentence, to mark where the stress is placed. Students should practice reading their sentences until they can read them to the class fluidly. The stress is particularly important for comprehension purposes. If you still have questions about the conditional tense in English, don’t hesitate to ask. Just comment below or shoot us an email! Make sure to sign up for our newsletter to receive lessons and other articles sent directly to you! Click here to subscribe to our newsletter!